I grew up on a farm in Ireland surrounded by dogs, cats, horses, and other farm animals. My work life has also been focused on animals starting as a certified riding instructor and stable manager in Ireland to writing about pets as a journalist in the United States. I believe that the secret to happiness is in helping others. My mission is to combine this belief with my passion, which is animals and animal welfare. With that in mind, my blog is all about helping people live happy and healthy lives with their animal companions. My passion for animal welfare and protection has led me to volunteer at animal shelters and with animal rescue groups for more than 30 years. 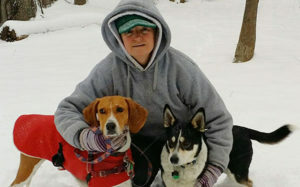 My husband and I share our home with a rescued American foxhound, Bella, and a border collie husky mix, Jason. They are the loves of our lives! I’m also a proud member of The Traveling Leash dog-walking team. I know how important it is to find caring and knowledgeable walkers and sitters, and I just love spending part of my day with my doggy buddies. Their “parents” are all wonderful people, too. As a seasoned freelance writer, I specialize in writing about pets and animal welfare. I was the Pet Columnist for 201 Family (formerly The Parent Paper) magazine for more than 15 years and also wrote pet and animal welfare articles for The Record newspaper, The Animal Companion, and Bone-A-Fide Mutts magazines, as well as for PetPlanet.com. I am the recipient of a Gold Award from the Parenting Publications of America, a Certificate of Merit Award from the Dog Writers Association of America, and a Certificate of Excellence Award from the Cat Writers’ Association Inc.
You can read a selection of my published pet and animal welfare stories here.